Living Lalique is the latest pillar fragrance for women from the Lalique brand. I adore Lalique Encre Noire (the one for men), but by and large the recent feminine fragrances (Amethyst, Encre Noire Pour Elle, Fleur de Cristal, Satine, L'Amour and Azalée) have not interested me, other than the bottles, which are generally every bit as covetable as you'd expect from a company that's in the business, after all, of making pretty glass. The lasting power is good but not fantastic, and it's rather close to the skin after the first hour. To my nose, it's entirely unisex. Verdict: Living Lalique is well done and easy to wear. It's oodles more sophisticated than most of what you'll find on department store counters, and it isn't massively fruity or massively sweet. Lalique's dedicated website for the fragrance talks about the "urban, contemporary, active life of the Lalique woman", and references New York, Paris and London. Usually when fragrance brands try to channel some amorphous idea of a luxury big city lifestyle2 they end up making something I wouldn't be caught dead wearing in any city, but I would wear Living Lalique anywhere without embarrassment. I feel almost churlish not loving it, but there it is. Lalique also calls it "soaring" and "sumptuous", and soaring and sumptuous are precisely the attributes that I found lacking in Living Lalique. The dry down smells a bit too flat, and like perhaps a greater investment in the raw materials might have made a big difference in the outcome.3 So, like but not love, although I'm very curious about the Extrait version. The Candy Perfume Boy liked Living Lalique much better than I did; do see his review. 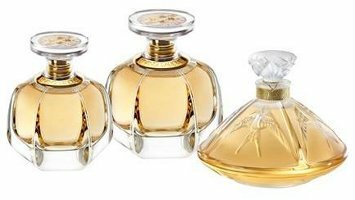 Living Lalique is available in 50 ($125) and 100 ($175) ml Eau de Parfum, or in 120 ml Extrait de Parfum ($1800, or $15,000 for a special presentation bottle with gold leaf). 1. If it helps, Living Lalique's dry down has the same soft-spoken character as Prada Infusion d'Iris, but seems less directly focused on the iris, more on the woody notes. Infusion de Cashmeran, perhaps. The expensive niche version might be Dries Van Noten par Frédéric Malle. 2. Lalique has outlined their aspirational vision for this woman in some detail, with separate itineraries for each city. In London she shops at Harrods and Fortnum Mason before dining at Sketch and going to the Royal Opera House, and the Lalique Rayons vase shown in what is presumably meant to be her apartment (see image at top) costs $50,000. New York includes breakfast at Balthazar, trips to MOMA and Henri Bendel, etc. and etc. Paris is more of the same. 3. Of course for all I know they spent a fortune on the juice. If so, it's even more disappointing that the dry down is so flat. It is definitely worth a shot. Prada Infusion d’Iris Absolue was less than that for 100 ml, so I say it’s still too much money for what it is (to my nose, the Absolue blows it away). Encre Noire was a fabulous fragrance in a fabulous bottle!! But I know what you mean. Off the top of my head, I would name Chamade parfum and Shalimar (any concentration) as fabulous fragrances in fabulous bottles. Ditto that! My other fav bottles are RL Safari and the Diptyque Essences Insensees. This sounded so promising till I hit “cashmeran,” one of the ingredients that comes across as overwhelmingly synthetic to my nose. Oh well, just a speed bump on Perfume Lane. Whoa, I missed the $15, 000 version! Yowza! And yes…I assume there weren’t many of those made, but I’d be pissed if I spent even the 1800 and got a boatload of cashmeran. But maybe the extrait is miles better. If you don’t like cashmeran, I’ll be very surprised if you like this. There is lots of it. I don’t know if the sandalwood is likewise synthetic or if it just smells synthetic because of so much cashmeran, but nothing in the dry down smells real to me. I don’t actually mind that if it doesn’t smell flat, but in this case, it does. This has probably not enough iris for me, but the idea of a (relatively) mainstream house coming out with a woody iris instead of an oud is still cheering. Or are my standards getting too low? I do think it’s cheering — we have enough ouds, and we don’t have enough of this sort of quiet but elegant perfume. I randomly sprayed this in a store a couple of weeks ago and was surprised how not bad at all this was. The conclusion was that I need to get a sample, and maybe your review will motivate me to finally do so. As I said above, I think it’s worth a shot. It might be the perfect no-brainer / quiet woods for somebody. This sounds similar in style (and mood) to lalique perfume (edp or edt). I mean the one in the rectangular bottle with a fan shaped lid. It’s soft but pleasing and has a slightly wheat-ish note to me! Anyway, this is much less feminine (and less floral, and less fruity) and less full-bodied than Lalique de Lalique. You’d be able to tell right away which was 2015 and which was early 90s. The Le Parfum has a similar shape to Encre Noire, I think. The one I mean is the tall slim bottle. It seems to be called Lalique by Lalique… And there is a pattern of leaves on the lid. Probably from the 90s! Yes, Lalique de Lalique is definitely early 90s. It is soft in its own way, but this is “spare” in the modern sense, and way more unisex. This sounds yummy. Haven’t tried much from Lalique. Didn’t read the clean musky part…not sure if Iike that. I did Lalique de Lalique.. It does not smell like laundry musk or heavy white musk, if that helps. I love Lalique le parfum and Perles, but this one doesn’t sound worth pursuing. Maybe when it makes its way to the discounters . . . I should have included Encre Noir in my list of Lalique loves – definitely up there with my favorite vetiver perfumes. I may have to try this Encre Noire. Same here, it’s a fabulous perfume. I still need to try the Sport version, who knows, maybe it’s fabulous too. I thought the sport version was fine, but if I remember correctly it had a drop or two of calone and I think I liked Vettiveru better for a cologne vetiver that wasn’t from Guerlain. It is basically free at the discounters and I haven’t bought a bottle which is saying something. Doesn’t sound like I’d love it either. The Elle version was a big disappointment already. I guess tastes differ but I like Encre Noire Sport very much. I’d probably get if I didn’t already have so many vetiver scents including EN original. And, if I found it for a particularly good price I would definitely get it! I think its less distinctive than the original because it has quite a bit of citrus and the citrus-vetiver combo has been done a number of times. While I like Vettiveru very much, the CdG is MUCH softer and has a more delicate milky tone. I too love Encre Noire, and (in the UK at least) you can buy a large bottle of it for around £20 if you look online, rather than the RRP of around £65. Nice discount! You used to be able to get it cheaply in the US too, and I assume you still can but have not looked. Robin – have you smell tested the Emozione? If so, how do these compare as more uh, sophisticated, powdery frags? I’d like to test these both. Your thoughts about the superiority of Infusion d’iris Absolue made me dig out my large sample of the same to wear today. Emozione is more of a cosmetic powder fragrance, much more feminine (and sweeter, and more floral) than this, a descendent of La Vie Est Belle. This is not cosmetic powder, more like a velvety woods.